Jacob (Jacques) BOURGEOIS, Druggist, 50; wife Jeanne TRAHAN 40; children: Jeanne 27, Charles 25, Germain 21, Marie 19, Guillaume 16, Marguerite 13, Francois 12, Anne 10, Marie 7, Jeanne; cattle 33, sheep 24. Jean GAUDET 96, wife, Nicole COLLESON 64; child: Jean 28, cattle 6, sheep 3. Denis GAUDET, 46, wife, Martine GAUTHIER 62; children: Anne 25, Marie 21, Pierre 20, Pierre 17, Marie 14; cattle 9, sheep 13. Roger KUESSY 25; wife, Marie POIRIER 22; child: Marie 2; cattle 3, sheep 2. Michel De FOREST 33, wife, Marie HEBERT 20: children: Michel 4, Pierre 2, Rene 1; cattle 12, sheep 2. [Marie GAUDET] widow of Etiene HEBERT 38, children: Marie 20, Marguerite 19, Emmanuel 18, Etienne 17, Jean 13, Francoise 10, Catherine 9, Martin 6, Michel 5, Antoine 1; cattle 4, sheep 5. 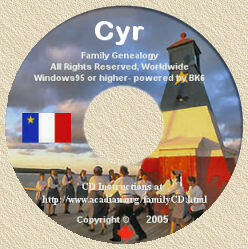 Antoine BABIN 45, wife, Marie MERCIER 25; Children: Marie 9, Charles 7, Vincent 5, Jeanne 3, Marguerite 1; cattle 6, sheep 8. Olivier DAIGRE 28, wife, Marie GAUDET 20; Children: Jean 4, Jacues, 2, Bernard 1; cattle 6, sheep 6. Antoine HEBERT, cooper, 50, wife Genevieve LAFRAND 58; Children: Jean 22, Catherine 15; cattle 18, sheep 7. Jean BLANCHARD, 60, wife, Radagonde LAMBERT 42; Children: Martin 24, Madeline 28, Anne 26, Guillaume 21, Bernard 18, Marie 15; cattle 12, sheep 9. Widow of Francois GUDCIN [GUERIN], 26; Children: Anne 12, Marie 9, Jerome 7, Huguetta 5, Francois 2; cattle 6, sheep 3. Michel DUPOUT [DUPUIS], 37, wife Marie GAUTEROT 34; Children: Marie 14, Martin 6, Jeanne 4, Pierre 3; cattle 5, sheep 1. Claude TERRIAU 34, wife, GAUTEROT 24; Children: Germain 9, Marie 6, Marguerite 4, Jean 1; cattle 13, sheep 3. Germain TERRIAU 25, wife, Andree BRUN 25; Child: Germain 2; cattle 5, sheep 2. Jean TERRIAU, 70, wife, Perrine RAU [BREAU] 60; Children: Claude 34, Jean 32, Bonaventure 30, Germain 25, Jeanne 27, Catherine 21, Pierre 16; cattle 6, sheep 1. Francois SAVOYE, 50, wife, Catherine LeJEUNE 38; children: Francoise 18, Germain 16, Marie 14, Jeanne 13, Catherine 9, Francoise 8, Barabe 6, Andree 4, Marie 2; cattle 4. Jehan CORPORON, 25, wife Francoise SAVOIE 18; Child: one daughter of 6 weeks; cattle 1, sheep 1. Pierre MARTIN, 70, wife, Catherine VIGNEAU 68; Children: Pierre 45, Marie 35, Marguerite 32, Andre 30, Mathier 35; cattle 7, sheep 8. Francois PELERIN, 35, wife, Andre MARTIN 30; Children: Hugette 5, Marie 3, Anne 10 months; cattle 3, sheep 4. Pierre MORIN, 37, wife Marie MARTIN 35; Children: Pierre 9, Louis 7, Antoine 5, Marie 3, Ann 10 months; cattle 3, sheep 4. Mathieu MARTIN, 35; Not married and weaver; cattle 4, sheep 3. Vincent BRUN, 60, wife Renee BRODE 55; Children: Madeline 25, Andree 24, Francois 18, Bastien 15, Marie 12; cattle 10, sheep 4. Francois GAUTEROT, 58, wife, Edmee LeJEUNE 47; Children: Marie 35, Charles 34, Marie 24, Rene 19, Marguerite 16, Jean 23, Francois 19, Claude 12, Charles 10, Jeanne 7, Germain 3; cattle 16, sheep 6. Guillaume TRAHAN, 60, wife Madelaine BRUN 25; Children: Guillaume 4, Jehan-Charles 3, Alexandre; cattle 8, sheep 10. Pierre SIRE, gunsmith, 27, wife Marie BOURGEOIS 18; Child: Jean 3 months; cattle 11, sheep 6. Pierre THIBEAUDEAU, 40, wife, Jeanne TERRIAU 27; Children: Pierre 1 and 5 daughters; cattle 12, sheep 11. Claude PETITPAS, 45, wife, Catherine BAGARD 33; Children: Bernard 12, Claude 8, Jean 7, Jacques 5 and 5 daughters; cattle 26, sheep 11. Bernard BOUR [BOURG], 23, wife Brancoise BRUN 19; child: 1 daughter; cattle 6, sheep 9. Bonaventure TERRIAU, 27, wife Jeanne BOUDROT 26; child: Marie 4; cattle 6, sheep 6. Michel BOUDROT, 71, wife, Michelle AUCOIN 53; Children: Francois 29, Charles 22, Jean 16, Abraham 14, Olivier 10, Claude 8, Francois 5, 4 daughters; cattle 5, sheep 12. Pierre GUILLEBAUT, 32, wife Catherine TERRIAU 20; Child: 1 daughter; cattle 6, sheep 5. Jean LaBATTE 33, wife, Renee GAUTHEROT 19; cattle 26, sheep 15. Martin BLANCHARD 24, wife, Francoise LeBLANC 18; cattle 5, sheep 2. Jean BOURC, 26, wife Marguerite MARTIN 27, children: 2 daughters; cattle 3, sheep 5. Antoine BOURC, 62, wife Antoinette LANDRY 53; Children: Francois 27, Jean 24, Bernard 22, Martin 21, Abraham 9, and 6 daughters; cattle 12, sheep 8. Laurent GRANGER, 34, wife, Marie LANDRY 24; Children: Pierre 9 months and 1 daughter; cattle 5 sheep 6. Perrine LANDRY 60, widow of Jacques JOFFRAIN. Pierre DOUCET, bricklayer 50, wife Henriette PELTRET 31; Children: Toussaint 8, Jean 6, Pierre 4, and 2 daughters; cattle 7, sheep 6. Francois BOURC 28, wife, Marguerite BOUDROT 23; Children: Michel 5, and 1 daughter; cattle 15, sheep. Germain DOUCET, 30, wife Marie LANDRY 24; Children: Charles 6, Bernard 4, Laurent 3, cattle 11, sheep 7. Francois GIROUARD, 50, wife Jeanne AUCOIN 40; Children: Jacob 23, Germain 14, and 3 daughters; cattle 16, sheep 12. Jacques BELOU, cooper 30, wife, Marie GIROUARD 20; Child: 1 daughter, cattle 7, sheep 1. Jacob GIROUARD 23, wife, Marguerite GAUTEROT; Child: Alexandre; cattle 7, sheep 3. Pierre VINCENT, 40, wife, Anne GAUDET 27; Children: Pierre 10, Rene 8, Andre 5, Jacques 2; cattle 11, sheep 9. Pierre MARTIN, 40, wife, Anne OXIHNOROUDH [OUESTNOROUEST] 27; Children: Pierre 10, Rene 8, Andre 5, Jacques 2; cattle 11, sheep 9. Vincent BROT, 40, wife, Marie BOURG 26; Children: Antoine 5, Pierre 1, 2 daughters; cattle 9, sheep 7. Daniel LeBLANC, 45, wife, Francoise GAUDET 48; Children: Jacques 20, Etienne 15, Rene 14, Andre 12, Antoine 9, Pierre 7, and 1 daughter; cattle 17, sheep 26. Michel POIRIER, 20 [son of deceased Jehan POIRIER]; cattle 2. Barbe BAIOLS [BAIOLET], widow of Saviniue de COURPON; 8 children in France and 2 daughters married in this country [Marie PESELET 26, Marianne LEFEBVRE 21]; cattle 1, sheep 5. Antoine GOUGEON, 45, wife, Jeanne CHEBRAT 45; Child: one daughter; cattle 20, sheep 17. Pierre COMMEAUX, cooper, 75, wife, Rose BAYOLS; Children: Etienne 21, Pierre 18, Jean 14, Pierre 13, Antoine 10, Jean 6, and 3 daughters; cattle 16, sheep 22. Jean PITRE, edge tool maker, 35, wife Marie PESELET 26; Children: Claude 9 months and 2 daughters; cattle 1. Etienne COMMEAUX 21, wife, Marie LEFEBVRE; Child: 1 daughter; cattle 7, sheep 7. Charles BOURGEOIS, 25, wife Anne DUGAST 17; Child: 1 daughter; cattle 12, sheep 7. Barnabe MARTIN, 35, wife, Jeanne PELLETROT 27; Children: Rene 8 months, and 1 daughter; cattle 3, sheep 2. Clement BERTRAND, carpenter 50, wife, Huguette LAMBELOT 48; cattle 10, sheep 6. Antoine BELLIVEAU, 50, wife Andree GUION 56; Children: Jean 19, and 1 daughter; cattle 11, sheep 8. Rene LANDRY, 52, wife Perrine BOURC 45; Children: Pierre 13, Claude 8, and 5 daughters, cattle 10, sheep 6. Thomas CORMIER, carpenter, 35, wife Madeline GIROUARD 17; Child: 1 daughter; cattle 7, sheep 7. Rene RIMBAUT, 55, wife, Anne-Marie; Children: Phillipe 16, Francois 15, and 3 daughters; cattle 12, sheep 9. Abraham DUGAST, gunsmith, 55, wife Marie-Judith DOUCET 46; Children: Claude 19, Martin 15, Abraham 10, and 5 daughters; cattle 19, sheep 3. Michel RICHARD, 41, wife, Madeleine BLANCHARD 28; Children Rene 14, Pierre 10, Martin 6, Alexandre 3, and 3 daughters; cattle 15, sheep 14. Charles MELANCON, 28, wife Marie DUGAST 23; Children: four daughters; cattle 40, sheep 6. Etienne ROBICHAUD told his wife that he did not wan to give account of his cattle and his land. Pierre LANAUX [LANOUE], cooper, sent word that he was feeling fine and he did not want to give his age. Phillippe MIUS, squire, Sieur de Landremont, wife Madeleine ELIE 45; Children: Marguerite, Marie-Anne, Pierre 17, Abraham 13, Phillippe 11, daughter "La Cadette" Madeleine 2; cattle 26, sheep 25. Armond LALLOUE, sieur de Derivedu, 58, wife Elizabeth NICOLAS; Children: Jacques 24, Armond 14, Arnault 12, Jeanne 20, Elizabeth 12. Guillaume POULET, wife and 1 child.